Providing you are not an HSC marker one of the best things about the Royal Easter show is a visit to the animal pavilions. Here it’s possible to feel, taste and smell something of the country, and never more so, if you actually catch a glimpse of a place where someone, maybe Roley Nancarrow himself, bunks down for the night. There would be a few personal items, lined up along a narrow wooden shelf, toothbrush, razor, a shaving mug and below it a bunk bed with some tartan blankets spread across it, blankets that look as if they’d spent more time on a horse’s back than on someone’s bed. To sleep here would seem the greatest fun, Famous Five sort of fun that young gels from the city rarely had. Gillian Mears Foal’s Bread sadly reveals that this kind of life is not all a city slicker might crack it up to be. The Nancarrows are tough, especially the women, and they need to be, dogged as they are by what seems relentless bad luck. The Nancarrows scrape a living off a small farm, ‘One Tree’, the kind of land the first squatters across the Blue Mountains wouldn’t have taken a second look at. They have more than their fair share of misfortune, early deaths, handicapped children, child abuse and one poor sod’s so bloody unlucky he’s struck by lightening – three times. One gets the impression that Mears may be aware the amount of misfortune she doles out is perhaps a little too much and there’s a Laugh Out Loud moment, in what could have been the worst moment of a book that has many, when Noah Nancarrow rides in and saves the day, crying out ‘For once we landed on the side of luck. Praise the Lord you feel like shouting but that would be inappropriate because God, if He exists at all at One Tree is, as Noah Nancarrow believes, a mean ol’ God and as soon as times get tough he’s jettisoned in favour of the dubious virtues of self-belief, alcohol or 24/7 baking. The hero of the book is Roley Nancarrow. Providing they’re not pedophiles Mears is kinder to male characters than female characters, and Roley and to a lesser extent his father, Septimus, are by far the nicest characters in the story. It is Roley whose efforts to overcome hardship evoke the most admiration and finally the most pity, and it is Roley who is the moral centre of the family. Roley judiciously cautions his family they ‘gotta take the good times with the bad’ and surprisingly there are some good times at One Tree. Roley and Noah Nancarrow are at their happiest when they feel their dream of becoming a record-breaking jumping team is achievable. Although few at One Tree recognise the good times until after they’ve been had and a sense that nothing good will last for long permeates the book. There’s no denying this downbeat take on life can be a little depressing but Mears also deftly weaves into her story glimmers of hope, small moments of reprieve, of pure joy and feelings of warmth and tenderness, usually, tellingly, internalized rather than voiced, that keep life on One Tree from tipping into total misery. Gillian Mears mentions in her acknowledgements she researched this book for years and given how familiar she is with the vernacular of the time one can well believe it. How deeply she is able to take her readers into the world of the Nancarrows; on some pages, especially when hardly daring to breathe for fear of what was coming next, I skimmed over whole sentences whose meanings I simply didn’t have the time to compute. Praise indeed, but a little frustrating as well. Mears is able to create the scrappy feel of the dried out bush, the dilapidated houses, and a people worn out through years of hard work and harsh climate; it’s as if she’s written the book using the sticks and stones and hard dirt of the bush. The real extent of Mears achievement is, as with all good books, only fully understood after the last page is read. She draws her story to a close by writing a fitting finale for her heroine Noah Nancarrow. “An only life can take so long to climb/Clear of its wrong beginnings, and may never,” says Philip Larkin and we finally understand that Noah Nancarrow has never managed to ‘climb clear of her wrong beginnings’. Mears is a writer of rare talent, the kind of writer who can sail over the writing equivalent of a seven foot three jump and come down to earth with arms outstretched. 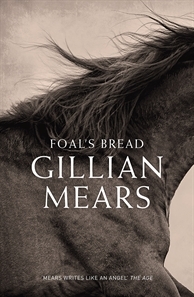 This entry was posted in Foal’s Bread, Gillian Mears, Issue 3, Kate Pardey and tagged gillian mears, literature, Nancarrow, Philip Larkin by Mark Roberts. Bookmark the permalink.